So today I'm going to speak about a dreaded word when it comes to body skincare.......STRETCHMARKS. There, I said it. I myself have stretchmarks. For those of you who don't know, I have a son. I was 18 when I had him and before I was pregnant I was very skinny. Of course my body changed and my skin stretched as my lil baba grew in my belly. I was concerned about stretchmarks.....to say the least!!! My sister who was pregnant also (6 weeks ahead of me which was lovely!!) 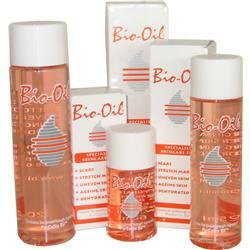 introduced me to BIO-OIL. I knew I had already developed some marks on my lower stomach and on my inner things so I wanted to prevent more from forming. From my own experience I highly highly recommend using Bio-Oil or what ever oil or cream you chose to use, the minute you find out you are pregnant or see you are gaining weight. These are NOT miracle products even though I'm sure you've heard they might be - but they ARE a huge help. Another thing I use Bio-Oil for is on my nail cuticles. I've never heard of anyone else doing this but I tried it one day and love how it moistened and softened my cuticles. I even think it slightly strengthened my nails! There are lot's of great ingredients in it including vitamin A, B and lots of oils. If you're interested in a list of ingredients click HERE. Obviously you can guess from the name, the product is oil based. It has Calendula Oil, Rosemary Oil, Lavender Oil and Chamomile Oil. It's not your typical type of oil though. It has a strange feeling when applied to the skin - it's a liquid form but much lighter than any other typical oil. Here's a snippet from the website about their main unique ingredient - PurCellin. "Bio‑Oil contains the breakthrough ingredient PurCellin Oil™, which changes the formulation’s overall consistency, making it light and non-greasy. This ensures that the goodness contained in the vitamins and plant extracts is absorbed into the skin." It has a strong smell that is quite hard to explain. I think it mostly smells of lavender. It has a small little hole on top which makes it handy for controlled use as you really don't need much product at a time. It spreads and absorbs beautifully. It is recommended for Bio‑Oil to be massaged in a circular motion into the stretch marks, twice daily, for a minimum of 3 months. So as you can image, some dedication is required if you are to see results. When I was pregnant I became so paranoid by stretchmarks I actually tracked my progress during and after I was pregnant and managed to find my comparison pics on my old laptop files. Apologies if the quality isn't great (photo was taken under natural light with no flash) but I hope you get the idea. The pictures below are results after using Bio-Oil for about 6-7 months. I'd just like to point out that over time skin will try to re-heal and re-nourish itself but I feel Bio-Oil certainly speeds up the process as moisture is a massive factor. As you can see the purple colour definitely faded and the ridges of the stretchmarks also reduced. You can still see that I have stretchmarks but it is much less noticeable - depending what light I am in. 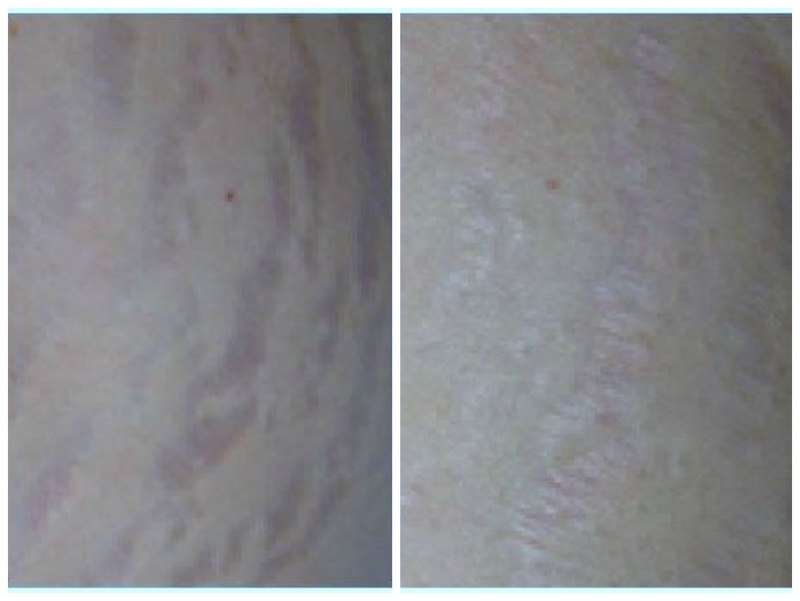 The picture on the right shows the "silvery" colour people speak about when their marks have healed as much as they can. This product was sent to me for free from Bio-Oil's PR Team for reviewing purposes (although my result pictures are from a few years ago after buying Bio Oi myself!). All opinions above are completely my own, 100% honest thoughts on the product.